Two films from Japanese filmmaker Seijun Suzuki are getting the Criterion Blu-ray treatment this December. In an early announcement to retailers, Criterion is preparing the 1967 crime comedy 'Branded to Kill' for Blu-ray on December 13. When Japanese New Wave bad boy Seijun Suzuki delivered this brutal, hilarious, and visually inspired masterpiece to the executives at his studio, he was promptly fired. Branded to Kill tells the ecstatically bent story of a yakuza assassin (chipmunk-cheeked superstar Joe Shishido) with a fetish for sniffing boiled rice who botches a job and ends up a target himself. This is Suzuki at his most extreme—the flabbergasting pinnacle of his sixties pop-art aesthetic. The Blu-ray will feature a 1080p transfer, uncompressed monaural soundtrack, and supplements will include: Video piece featuring new interviews with director Seijun Suzuki and assistant director Masami Kuzuu; Interview With Suzuki From 1997; New interview with actor Joe Shishido; Original theatrical trailer; and a booklet featuring an essay by critic and historian Tony Rayns, author of Branded to Thrill: The Delirious Cinema of Suzuki Seijun, and a state­ment by the film's art director, Sukezo Kawahara. 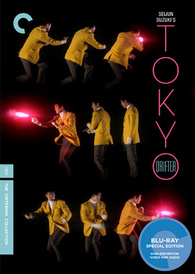 The director's 'Tokyo Drifter' will also be available on Blu-ray on the same date. In this jazzy gangster film, reformed killer Phoenix Tetsu’s attempt to go straight is squashed when his former cohorts call him back to Tokyo to help battle a rival gang. This onslaught of stylized violence and trippy colors got director Seijun Suzuki in trouble with Nikkatsu studio heads, who were put off by his anything-goes, in-your-face aesthetic, equal parts Russ Meyer, Samuel Fuller, and Nagisa Oshima. 'Tokyo Drifter' is a delirious highlight of the brilliantly excessive Japanese cinema of the sixties. The Blu-ray will feature 1080p video, an uncompressed monaural soundtrack, and supplements will include: Video piece featuring new interviews with director Seijun Suzuki and assistant director Masami Kuzuu; Interview with Suzuki from 1997; Original theatrical trailer; and a booklet featuring an essay by film critic Howard Hampton. Suggested list price for each Blu-ray is $39.95. You can find the latest specs for 'Branded to Kill' and 'Tokyo Drifter' linked from our Blu-ray Release Schedule, where they're indexed under December 13.